Most Halloween stories are told to a tune of scary music that leave you feeling frightened and weary. When given the choice of trick or treat, we will all typically choose treat. Today, I want to take some of the scare out of one topic — young sires — and focus on the treats. I truly understand that many feel the use of young sires is a genetic gamble. Why use a young sire when there are so many choices of good proven bulls available? That gamble of the unknown can feel scary at times. I think our farm’s decision to use any young sire that appropriately fits our breeding philosophy comes from a commitment to contribute to the next generation. Genomics certainly make the gamble more interesting. But looking at a bull on paper through either genomics or parents averages and actually seeing his genetic potential realized in offspring are two different things. No matter how much we study genetics, there will always be surprises and disappointments, which can feel like a major trick. The willingness to use young sires helps to provide the real life data that makes the next generation possible. Sometimes those surprises and even disappointments still yield great results. One of our all-time favorite cows was sired by a young sire that didn’t make it. She exemplified our breeding philosophy with over 180,000 pounds of milk lifetime, Excellent 92, and lasting to 14 years old while calving yearly. While her success was considered an outlier for the breed as a whole, we wouldn’t have enjoyed her genetic potential treat without taking the gamble. Here’s an even sweeter treat that makes a good incentive for taking on this risk. Young sires are almost always more affordable. Working even a small percentage into your breeding program is an economical decision. We all want the next generation of our herd to be better then the last. We all have a little different breeding philosophy when it comes to our herds’ goals, but I don’t think there is any reason to let the scare of the unknown discourage you from using young sires. The author is a third-generation dairy farmer from Oregon where she farms in partnership with her husband and parents. As a mother of two young boys who round out the family run operation as micro managers, Darleen blogs about the three generations of her family working together at Guernsey Dairy Mama. 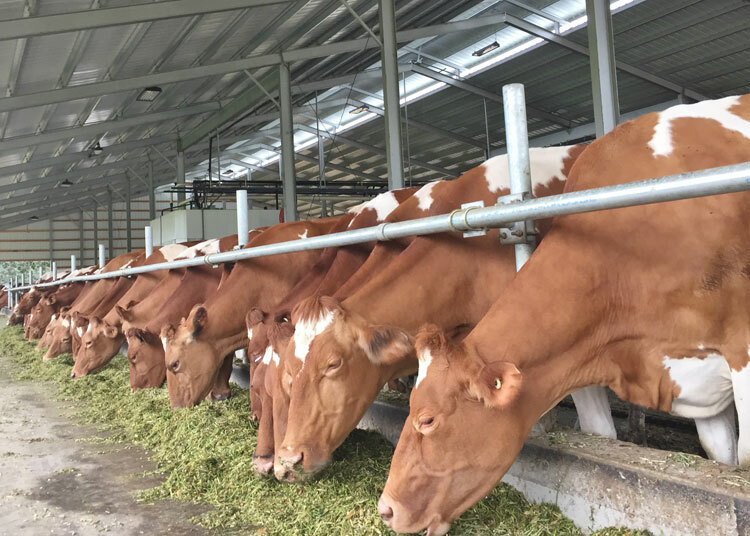 Abiqua Acres Mann's Guernsey Dairy is currently home to 90 registered Guernseys and is in the process of transitioning to a robotic milking system.